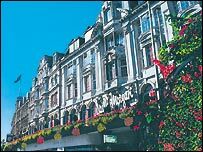 Flats converted from one of Cardiff's most well-known department stores have sold out within an hour of going on sale. The David Morgan buildings in the city centre are being redeveloped after the family-run business closed its doors on 125 years of trading in January 2005. One buyer bought 10 of the properties on offer. 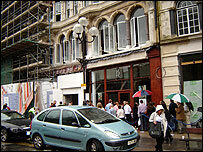 Some had queued since Monday to snap up one of the 56 apartments, which ranged in price from £150,000 to £250,000. The total value of the morning's sale was estimated at about £11m. Wet weather on the morning of the sale did not deter interested parties from far and wide trying to get a piece of retail history to live in. Maureen Murphy from Blackwood and her daughter Nicola McDonald from Newport were interested in the properties for different reasons. Former David Morgan customer Mrs Murphy, who has lived in Blackwood most of her life, said she was attracted to the apartments because of the building, and would consider moving to Cardiff to retire. "I could go out to Starbucks for coffee at breakfast time," she joked. The site appealed to her because "it's old, it's not red-brick, it's a beautiful building - I wouldn't be interested in anywhere else." "I used to come to David Morgan to shop," she added. Mrs McDonald's interest was more commercial. As a property developer, she was looking to buy to rent, and believed the David Morgan site would be an attractive proposition for tenants. "It's right in the city and it's a beautiful building," she said. In the queue behind, Katherine and Wyn Rees from Cardigan were waiting with their son to look at an apartment with a view to using it as a second home in the city. The couple already own a flat nearby but said they would sell it to be able to move across to the David Morgan apartments if they liked them. Mrs Rees said: "We come down to Cardiff quite often because my brother lives here." Mr Rees said having a property in the city centre made it easier on him for business travel, and was handy for occasions like the rugby internationals. "If I have to go to a meeting in London, I can come to Cardiff the night before and stay here then travel on in the morning. "Whenever you try to come for the internationals for example, it's impossible to get a hotel, or they double the prices." In the event, all three hopefuls were unlucky this time. The demand for the flats meant only the very earliest comers were lucky - in one case, a buyer snapped up 10 of the apartments in one go. Andrew Sinclair, commercial director of Denham Homes, one of the joint developers, said: "There was always a first come, first served basis. 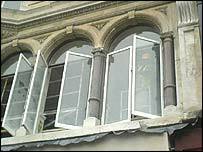 "The building itself is a very important landmark in Cardiff. Its history is well-known to the residents. Now it's being converted to housing and mixed use development, I think they'll be very keen to have a part of it."